Dental hygienists are licensed health professionals who provide preventive and therapeutic care in the management of oral diseases. As a hygienist, you’ll conduct oral examinations, provide preventive dental health care, expose and process dental radiographs, and help educate patients about oral health and its impact on the entire body. As we learn more about the impact of dental health on the whole body, the role of the hygienist may become even more crucial. Your education about the importance of good oral health can have an impact on your patients’ well-being. This program will prepare you to perform dental hygiene services in accordance with the state practice act and reflects current theory and practice. 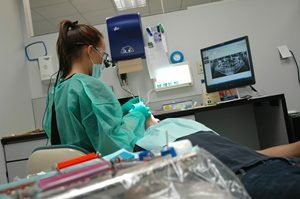 After completing all of the requirements of the program, in order to be fully licensed as a dental hygienist, you must successfully take national and regional board examinations, complete criminal background check/fingerprinting and apply for licensure in order to practice Dental Hygiene in the state of Ohio. In addition to treating patients directly, dental hygienists may also work as educators, researchers, and administrators in healthcare agencies, hospitals, sales, and in government programs. As an LCCC dental hygiene student, you will work with our highly qualified dental professionals to provide members of the community with educational, preventive and therapeutic dental hygiene services at a nominal fee.